In this VIS image, taken by the NASA - Mars Odyssey Orbiter on November, 1st, 2015, and during its 61.587th orbit around the Red Planet, we can see, once again (after the APOD of June, 21st, 2014), a small portion of a Channel which is are part of (---> belongs to) a Complex Valleys System known as "Mamers Valles". Mamers Valles is located on the Northern Margin of the Martian Region known as Arabia Terra, and it is a long (as well as quite large and deep) winding Channels' System that covers approx. 1000 Km (such as about 621 miles), cutting through the highly Cratered Uplands of Arabia Terra, from Cerulli Crater, up to the Martian Region known as Deuteronilus Mensae, which is found near the edge of Mars' vast Northern Lowlands. 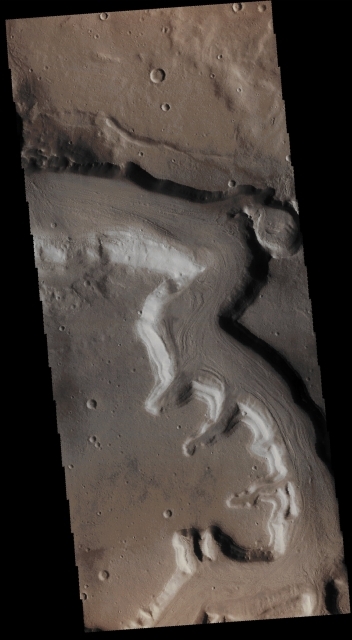 Through its midsection, the Channels' System of Mamers Valles shows an average width of about 25 Km (such as approx. 15,525 miles) and an average depth of 1200 meters (such as about 3935,99 feet). The most popular theory (note: we wrote the "most popular", BUT NOT necessarily the correct one!) states that the Channels were likely formed by either Water or Lava (we, as IPF, strongly suggests that was running Water that carved them, and NOT Lava! ), with the Flow running from South to North. According to the opinion of a number of Planetary Scientists, the Linear Features visible (even here, in this picture) on the Valley Floor, may also indicate the passage of possible Ice Flows, and that Ice might even currently (---> meaning now) be there, in the Sub-Surface, in very large quantities (and ready to be used!). Just out of curiosity, the formation of the Mamers Valles Valleys' System is dated to the early Hesperian Period, such as about 3,8 Billion Years ago. This image (which is a crop taken from an Original Mars Odyssey Orbiter b/w and Map-Projected frame published on the NASA - Planetary Photojournal with the ID n. PIA 20221) has been additionally processed, magnified to aid the visibility of the details, contrast enhanced and sharpened, Gamma corrected and then colorized in Absolute Natural Colors (such as the colors that a human eye would actually perceive if someone were onboard the NASA - Mars Odyssey Orbiter and then looked down, towards the Surface of Mars), by using an original technique created - and, in time, dramatically improved - by the Lunar Explorer Italia Team.